Welcome to Relief Report – our blog to keep you up-to-date on Relief Brigade’s activities and highlights throughout the year. As 2017 comes to a close, I look back at a year where we helped more people in need than ever before, all thanks to generous support from our sponsors and donors. In total, we raised more than US$40,000 for our two charities – The Ernie Deomampo Charitable Trust and Relief Brigade, Inc. This is amazing considering we started out in 2011 as a group of friends pitching in a couple hundred bucks to keep a promise made to Ernie right before he passed away. 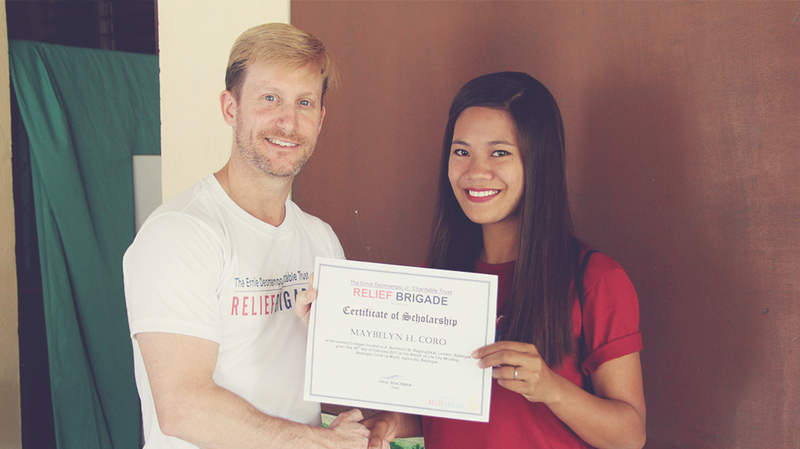 Our goal at Relief Brigade is to take this support and help as many people as possible in the Philippines in lasting and positive ways. We’ve been working in the country almost seven years, and admittedly at first the best we could do was simply provide handouts – canned goods and rice. But as we’ve gotten to know the communities and built relationships, we have improved our efforts and now use your support to help families build their own path out of poverty. We’ve established and continue to fund The Ernie Deomampo Jr. Memorial Scholarship. We partner with a group of doctors to provide free medical clinics, and we’ve helped families build their own sources of income by giving them goats and chicks. A helping hand up, not a handout, is our driving belief. We are constantly evaluating how best to use your generous support to maximum effect. For example, we are moving away from canned goods giveaways to a more tailored program – Groceries for Grades. Our team on the ground is working with community leaders and public school administrators to identify families whose children simply do not go to school. In exchange for proper school attendance we will provide the family with groceries on a monthly basis. We will always evaluate how best to help students, families, and those in need with the goal of empowering them to improve their lives and their communities. Moving from canned goods giveaways to our Groceries for Grades program is just one example. One element of our charities that will never change is that you will always know exactly where your donations go. Yes, the two charities have grown – but there are no executives jetting around in first class or staying in posh hotels using your donations. I treasure the fact that we are small enough and have enough dedicated volunteers so that our admin costs are minimal and are taken care of separately from the donations to help those in need. If you buy a goat, for example, all of that money goes to buy the goat. In fact, during Relief Week many of you donated $80 to buy goats, but we were able to negotiate a better deal because of the size of our purchase. We then simply reinvested the difference back into buying more goats, because it was given only for that purpose. Similarly, it was a big step to hire two part-time team members on the ground in the Philippines (I will highlight them in our next Relief Report). But their wages are paid by an anonymous donor who sees the need and is happy for his funds to support that effort. This allows us to keep our promise – 100% of your donation goes directly to those in need in the form you select. Enabling us to do this is the generous support of, among others, an international law firm that provided us with pro bono services to establish and register The Ernie Deomampo Charitable Trust in Australia with the Australian Charities and Not-for-profits Commission and to incorporate Relief Brigade, Inc. as a 501(c)(3) tax-exempt charity in the USA. We also have a CPA who volunteers his time to properly manage our accounts, and a volunteer team of web designers, copywriters, and graphic designers. We are a growing group of volunteers and of donors all with one aim – help those in need in the Philippines pull themselves out of poverty. I hope you enjoy reading our Relief Report and that it provides you with a better understanding of what we do, how we do it, and how your support has helped so many in the Philippines. To keep up-to-date you can follow us on Facebook or sign up for our newsletter to read more on how your support has impacted those in need in the Philippines and allowed our charity efforts to continue to grow. Thank you for coming on this journey with us. Together we are changing the lives of those in need. Founder & Director, Relief Brigade, Inc. Relief Brigade Inc is a 501(c)(3) tax-exempt non-profit corporation, incorporated under the laws of Delaware. Your donations are tax deductible. The Ernie Deomampo Charitable Trust, ABN 68 549 581 766, is a Registered Charity with the Australian Charities and Not-for-profit Commission. Unfortunately, at this time donations to the Ernie Deomampo Charitable Trust are not tax deductible. If you purchase an item in our Relief Mart or otherwise donate to The Ernie Deomampo Charitable Trust or Relief Brigade Inc, you consent to the use of your name appearing on this website and social media, including but not limited to Facebook and Instagram, whether in writing or in pictures/digital images. Should you wish not to have your name used in this way please let us know by emailing us at reliefbrigade@gmail.com. © 2017 The Ernie Deomampo Charitable Trust. All Rights Reserved.